We seek to help individuals find meaning and fulfillment in life through a personal relationship with Jesus Christ. For over 40 years now people find strength to face life’s challenges in our shared commitments to worshipping God, serving Jesus, and living in the power of the Spirit as we reach out in love to others. 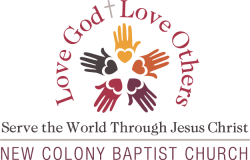 Individuals are discovering meaning and purpose in life through a growing relationship with Jesus Christ and a growing group of friends who seek to encourage one another through New Colony Baptist Church. Because Jesus Christ is the Head of The Church, His Body, He is to have preeminence in all things. As we gather to worship Jesus Christ, the Lord sends us out in missionary activity to reach the lost of this world as His mission becomes our mission. Both evangelism and missions are concerned with communicating the good News of Jesus Christ to unbelievers of all cultures. Growing in faith and being equipped to live the Christ-life and then sharing our faith in Christ with others so that spiritual reproduction occurs in each succeeding generation.